The cross-operational function of quality management in our companies will have to achieve ever-greater effectiveness in order to satisfy market requirements in terms of automobiles and their components. In addition to the technical expertise which is essential to ensure quality, current and accurate decision-making depends on quality data which are exchanged more rapidly then ever with the aid of data processing and transmission between customer and supplier. To provide a uniform basis for this exchange of quality data and to increase efficiency, this present document sets out an exchange format based on XML (eXtensible Markup Language). 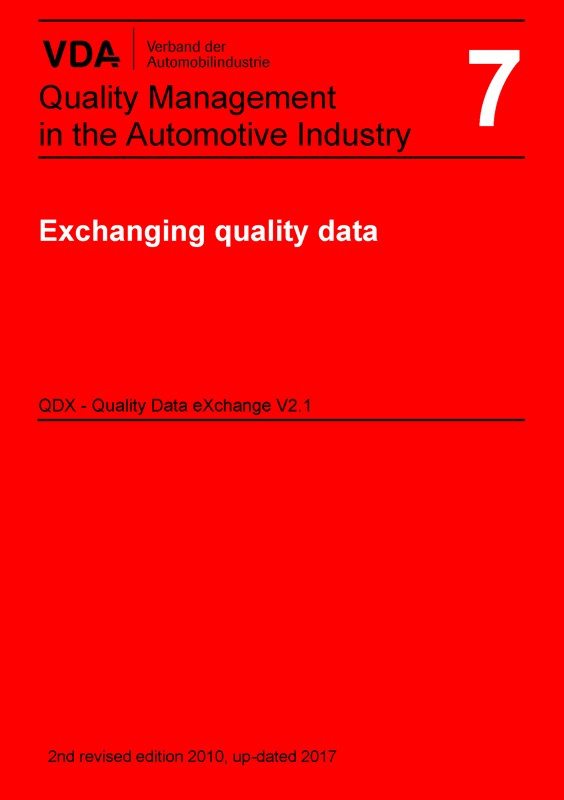 A VDA working group, composed of representatives of the automotive industry and companies specialising in information technology has described the processing of information in the field of quality data exchange over a period of around two years. This VDA publication represents an expansion of the related VDA recommendations (for example, VDA volume: „Standard Process for Handling Customer Complaints“), in which quality processes supported by QDX and the documents generated (and used) thereby are described in detail. This present VDA publication, therefore, has neither the objective nor any claim to provide further, redundant recommendations or requirements regarding processes; the contents themselves are presented only as recommendations. Whether, where and to what extent QDX is used in the automotive industry cannot be dictated by the VDA. That decision must always be taken by the two organisations wishing to exchange quality data directly between their respective IT systems. As a general rule, the customer will expect his suppliers to provide quality data in the QDX exchange format.